An aerial view of the Belvedere Castle, designed in 1869 by Calvert Vaux. Ask a traveler to name the best neighborhood and New York and they’ll rattle off a few familiar names — the West Village is usually high on the list, Chelsea, too, SoHo for the rich and fashionable, and Williamsburg for the hipsters. We know Brooklyn is for the cool kids and Hell’s Kitchen is for the gay boys. They each have their share of culture and performances, restaurants and cozy cafes, and some are renowned for the gay life. But what if there was a ‘hood in NYC that had it all, plus enough nature to make you forget you were living in a labyrinth of steel ad concrete? For all of our exploring New York — we were shocked to discover one neighborhood we really didn’t know at all: the 834 acres of Central Park. You could make the point that it’s not a neighborhood, and we won’t argue, though it is twice the size of autonomous state and so rich with culture, food, nature, and art it puts most mid-sized cities to shame. But because it’s not a neighborhood, per se, the details of its marvelousness are too often left off the ubiquitous lists about New York. Instead we hear “go to Central Park!” But where? How many visitors — or worse, how many New Yorkers — really know what lies within those near thousand acres. The host of Shakespeare In The Park is the country’s best outdoor theater. During the summer, tickets can be hard to come by (the first come, first serve rule is brutal, and snagging two seats to see De Niro play Lear can be harder than the nose-bleeds to a One Direction concert) but still, it’s a gorgeous experience. And if your pockets are deep enough, you can buy reserved seats for a few hundred bucks. Travelers usually bee-line it to Broadway, but summer visitors should check this out, too. 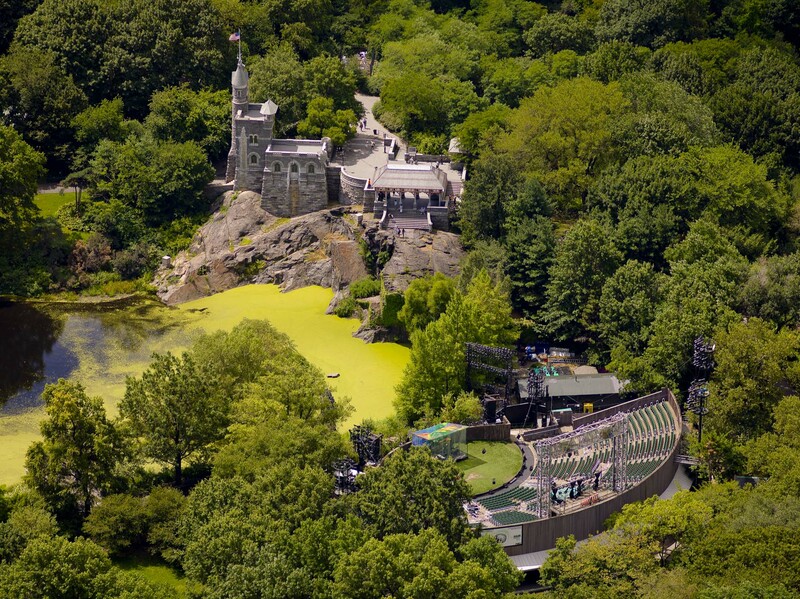 The fantastical Belvedere Castle, designed in 1869, has two observation decks overlooking the park’s theater, Turtle Pond, and the Great Lawn. But the castle itself is the best view of all. Step off of 79th street and walk mid-park to find it, and yo’ll be transported a world away. One of our favorite gardens in the world, the Shakespeare Garden is just magical, conceived in 1880 using flowers mentioned in Shakespeare’s poems. The pathways, rustic wooden benches, fairytale bridges, close to the Swedish cottage, and among the loveliest walks in New York. Overlooking the lake, the Bethesda Terrace and Fountain is a beautiful resting place, great for photo-ops. It’s a little touristy, and among the more well-known areas of the park, but still a scenic place to visit and regroup. In 2009, Out magazine called Sheep’s Meadow the gay mecca of New York. It wasn’t exactly a secret, but the point was valid. Bears, twinks, and gays of all assortments began to gather in the grassy knoll area knows as Sheep’s Meadow. Cruise at your own risk, but come to meet local gays. One of the great museum’s of the world, The Met was founded in 1870 and features 2,000 square feet of Asian, Egyptian, European, Greek, Islamic, and Medieval masterpieces that helped shape the art world as we know it. The fee is whatever you choose to pay, though they recommend $25. A quiet romantic spot that would work as a storybook wedding or just a place to stroll with your partner. It’s a small enclave of piece in an otherwise chaotic city, and a welcomed one at that. The Great Lawn is exactly that, a 55-acre space where you can throw down a blanket and have a picture perfect picnic, with skyscrapers peering out above shrouds of trees. Baseball parks, lakes, ponds, playgrounds and a bevy of activities surround you. One of the great open spaces of nature in the city, for those days when you just need to smell some grass and feel at one with nature. The lawn runs from 79th street to 86th street. Central Park has no shortage of eating options — Tavern on the Green may be its most famous, alongside The Loeb Boathouse, where you can have a weekend brunch that’s out of a movie. There are also small cafes weaved between its bike trails, and an adorable Le Pain Quitidien, should you need a coffee break.